For other uses, see Marine. Marines, also known as naval infantry, are typically an infantry force that specializes in the support of naval and army operations at sea and on land and air, as well as the execution of their own operations. In many countries, the marines are an integral part of that state's navy. In others, it is a separate organization altogether, such as in the United States, where the Marine Corps falls under the US Department of the Navy, yet it operates independently (and similarly the UK's Royal Marines come under Her Majesty's Naval Service). Marines can also fall under a country's army like the Troupes de marine (French Marines) and Givati Brigade (Israeli Marines). Historically, tasks undertaken by marines have included: helping maintain discipline and order aboard the ship (reflecting the pressed nature of the ships' company and the risk of mutiny), the boarding of vessels during combat or capture of prize ships, and providing manpower for raiding ashore in support of the naval objectives. In the earliest day of naval warfare, there was little distinction between sailors and soldiers on a warship. The oarsmen of Ancient Greek and Roman ships had to be capable of fighting the rowers of opposing ships hand-to-hand; though hoplites began appearing on Greek ships specifically for the boarding of enemy ships. The Roman Republic was the first to understand the importance of professional soldiers dedicated to melee combat onboard of ships. During the First Punic War, Roman crews remained inferior in naval experience to the Carthaginians and could not hope to match the Carthaginians in naval tactics, which required great fleet maneuverability and tactical experience. 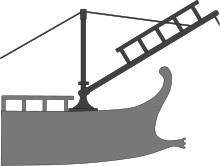 The Romans therefore employed a novel weapon which changed sea warfare to their advantage — they equipped their ships with the corvus, a long pivoting plank with a beak-like spike on the underside for hooking onto enemy ships, possibly developed earlier by the Syracusans against the Athenians during the Sicilian Expedition of the Peloponnesian War. Using it as a boarding bridge, Roman infantrymen were able to invade an enemy ship, transforming sea combat into a version of land combat, where the Roman legionaries had the upper hand. During the early Principate, a ship's crew, regardless of its size, was organized as a centuria. Crewmen could sign on as naval infantry (called Marinus), rowers/seamen, craftsmen and various other jobs, though all personnel serving in the imperial fleet were classed as milites ("soldiers"), regardless of their function; only when differentiation with the army was required, were the adjectives classiarius or classicus added. The Roman Navy's two fleet legions, I Adiutrix and II Adiutrix, were among the first distinct naval infantry units. The first organized marine corps was created in Venice by the Doge Enrico Dandolo when he created the first regiment of ten companies spread on several ships. That Corps participated to the conquest of Byzantium (1203-1204), later officially called " Fanti da Mar" (sea infantry) in 1550. Later also the Spanish king, Carlos I, assigned the naval infantry of the Compañías Viejas del Mar de Nápoles (Naples Sea Old Companies) to the Escuadras de Galeras del Mediterráneo (Mediterranean Galley Squadrons) in 1537, progenitors of the current Spanish Navy Marines (Infantería de Marina) corps, making them the oldest marine corps still in active service in the world. The third oldest marine corps in the world was founded as the Terço of the Navy of the Crown of Portugal in 1618, predecessor to the modern Portuguese Marine Corps. The English noun marine is from the adjective marine, meaning "of the sea", via French marin ("of the sea") from Latin marinus ("of the sea") itself from mare ("sea"), from Proto-Indo-European *móri ("body of water, lake") (cognate with Old English mere ("sea, lake"), Dutch meer, German Meer, all from Proto-Germanic *mari). The word marine was originally used for the marine-type forces of England; however, in many European languages the word marine or marina means "navy" – for example, in Dutch, French, Italian, German, Spanish, Danish, and Norwegian. Because of this use of "marine" to mean "navy", exact one-word translations for the English term "Marines" do not exist in many other languages, which can lead to misunderstandings when translating, with the notable exception of the Dutch word marinier. Typically, marine forces in non-English speaking countries have names that translate in English to naval infantry or coastal infantry. In French-speaking countries, two phrases exist which could be translated as marine, "troupes de marine" and "fusiliers-marins"; similar phrases exist elsewhere, e.g., in Portuguese Fuzileiros Navais. The principal role of marine troops is military operations in the littoral zone; operating from ships they are trained to land on and secure key points to around 50 miles inland, or as far as ship borne logistics can provide. Marine units primarily deploy from warships using boats, landing craft, hovercraft, amphibious vehicles or helicopters. Specialist units are also trained in combat diving/combat swimming and parachuting. As well as amphibious operations, marine troops are used in a variety of other, naval roles. Stationed at naval bases or forming marine detachments on board naval ships, they also conduct small scale raiding, maritime boarding operations, security of naval vessels and bases, riverine and coastal missions, mess duty, and field day operations. In addition to their primary roles, they perform other tasks, including special operations and land warfare, separate from naval operations; ceremonial duties and miscellaneous other tasks as directed by governments. The Argentine Marine Corps (Infantería de Marina de la Armada de la República Argentina or IMARA) is a part of the Argentine Navy. Argentine marines have the same rank insignia and titles as the rest of the navy. It is composed of a fleet marine force (one marine battalion, plus artillery, air defense, communications, logistics, engineer and vehicle units), a southern marine force (two marine battalions), a river operations battalion, a special forces unit (the Amphibious Commandos Group) and several security battalions and companies. The Argentine Marine Corps dates from 1827 when a single infantry battalion was raised. This was expanded in 1880 but seven years later the corps was merged with the existing coast artillery, to form a Naval Artillery Regiment. A series of reorganizations followed until responsibility for coastal defense was passed to the Argentine Army in 1898. 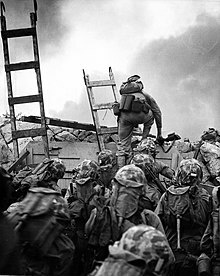 Between 1935 and 1938 the marines reappeared in the form of five battalions of Marine Infantry, serving both on board ship and in coastal defense fortifications. In 1968 the Infanteria de Marina was reorganized as a separate corps distinct from both Navy and Army. The 5th Battalion of the Argentine Marines fought in the Falklands War (Spanish: Guerra de las Malvinas/Guerra del Atlántico Sur). 2nd Battalion, Royal Australian Regiment – retrained in an amphibious light infantry role from 2012. The Royal Bahamas Defence Force (RBDF) is the navy of The Bahamas. Since the Bahamas does not have an army or an air force, its navy composes the entirety of its armed forces. The RBDF Commando Squadron is a sizable force of 500 Special Marine Commandos. The Bolivian Naval Force includes about 2,000 naval infantry personnel and marines. These are organized into seven small battalions. Brazilian marines demonstrate lane training. The Corps of Naval Fusiliers (Corpo de Fuzileiros Navais), with about 15,000 men, is subordinate to the Brazilian Navy. The marine corps is composed of an operational brigade and some guard and ceremonial duty battalions. The main unit is the brigade-sized Divisão Anfíbia (Amphibious Division). The Royal Cambodian Navy created a force of 2,000 marines in 2007. The 4,200 strong Chilean Corps of Naval Infantry (Cuerpo de Infanteria de Marina) is a branch of the Chilean Navy. Specialized in amphibious assaults and land fighting, the corps is build around four detachments based along Chile's long coasts at Viña del Mar, Talcahuano, Punta Arenas and Iquique. Each detachment is made by infantry battalions as well as tactical support companies comprising artillery, air defence and light tanks elements. There are also a number of independent companies and platoons, for security protection at naval bases, other shore installations and the Ministry of Defense. The Viña del Mar and Talcahuano detachments contribute to the Amphibious Expeditionary Brigade (Brigada Anfibia Expedicionaria). The detachment at Iquique includes a whole artillery group, equipped with Soltam 155mm howitzers for coastal defence and land fire support. There is as a group of Marine Infantry commandos (Grupo de Comandos IM), which together with the group of naval tactical divers (Agrupación de Buzos Tácticos) are part of the Navy's Special Operations Command (Comando de Operaciones Especiales). The People's Liberation Army Navy Marine Corps are the marines of China. It consists of 20,000 soldiers who are divided into three brigades. The PLAMC is a service branch of the PLA Navy, and is therefore under the command of the PLAN Headquarters, alongside the Joint Staff Department and the Chairman of the Central Military Commission. The majority of the PLAMC's personnel is based in the South China Sea. The 24,000-member Colombian Marine Corps is organized into a single division with four brigades (one counter-terrorist and three river brigades), each with several battalions plus numerous small security units. It is a part of the Colombian Navy. The modern Marine Corps dates from the establishment of two rifle companies in 1936. While remaining a small force the corps saw service during the civil war between Conservatives and Liberals of 1946-58; and provided volunteers for service in the Korean War. By the 1960s it had been expanded to a battalion of marine infantry plus five independent companies. The Cuban Revolutionary Navy (Marina de Guerra Revolucionaria or MGR) maintains a small marine battalion called the Desembarco de Granma. The Guard Hussar Regiment (Gardehusarregimentet or GHR) maintains a marine squadron based in Almegårds Kaserne on the Baltic island Bornholm. The squadron is a part of the 3rd Light Reconnaissance Battalion and trains conscripts. The 5,000-man Ecuadorian Navy maintains a 1,700-man Naval Infantry Corps (Cuerpo de Infanteria de Marina) headquartered in Guayaquil. It was formed on 12 November 1962. It is organised into two security battalions, one in the Amazon River area and the other on the Pacific coast. There is also a commando battalion based on the Galápagos Islands. The 111th Independent Mechanized Brigade (formerly the 130th Marine Amphibious Brigade) of the Egyptian Army can conduct amphibious assault operations. There is also the 153rd Commando Group with three Marine Commandos Battalions (515th, 616th, 818th) controlling 12 Marine Commandos Companies. The El Salvador Navy included two 600-man Marine Infantry Battalions (Batallon de Infanteria de Marina or BIM), and a 300-man Naval Commando Force. The BIMs were located at La Unión and Usulatan. The Salvadoran Marine Corps uses green pixelated and green woodland uniforms. The Finnish Uusimaa Brigade (Swedish: Nylands Brigad) in Ekenäs is the home of the Finnish Marines — the Kustjägarna (in Swedish) / Rannikkojääkärit (in Finnish) / or Coastal Jaegers (in English). The Brigade is part of the Finnish Navy, and the only Swedish-speaking unit within the Finnish Defence Forces. The Fusiliers Marins (Naval Fusiliers) and Commandos Marine (Naval Commandos) are naval personnel. The fusiliers marins protect vessels and installations, provide the navy with military training, augment boarding-landing parties and support operations of the Commandos Marine. The Commandos Marine (Naval Commandos) are a seven company Commando formation whose roots can be traced to the Second World War. The Commandos Marine have evolved to be broadly comparable to the British Special Boat Service, with whom they exchange officers. Troupes de Marine ("Marine Troops"), are a branch of the French Army, renamed from the Troupes Coloniales who served in France's overseas territories to maintain or expand French interests. The modern Troupes de Marine have units permanently based in Africa: one battalion in Senegal, one battalion in Côte d'Ivoire (until 2009, now forming the core of Operation Unicorn), and one battalion in Gabon; in addition they man bases in the French Overseas Territories. The Troupes de Marine include infantry (Infanterie de Marine), paratroops, light cavalry and artillery (Artillerie de Marine). They now provide the large ground combat elements of French amphibious task forces and are specifically trained for that purpose. The 9th Marine Brigade (9e Brigade Légère Blindée de Marine (9 BLBMa)) is twinned with the 3 Commando Brigade of the Royal Marines, organising the exchange of officers and sharing training and exercises. A German Navy boarding team member provides security for the remainder of his team as they board a local cargo dhow by fast rope to conduct a search of the vessel. The Spezialisierte Einsatzkräfte Marine (Naval Special Deployment Force) was a special operations formation of the German Navy. The battalion included the Kampfschwimmerkompanie (German commando frogmen), the Minentaucher kompanie and a boarding-company. The unit was based at Eckernförde. The Marineschutzkräfte (Naval Protection Force), was responsible for the protection of naval bases and facilities and also conducted small scale landings. The battalion was based in Eckernförde and was organized into five units: one staff & support company, three infantry companies, and an intelligence section. The Greek 32nd Marine Brigade "Moravas" (32η Ταξιαρχία Πεζοναυτών Mοράβας) and the Amphibious Raider Squadrons (known as MAK) are amphibious infantry and maritime operations units maintained by the Hellenic Army and supported by the Hellenic Navy. The Honduran Navy established at least one 600-man marine infantry battalion (Batallón de Infantería de Marina or BIM) in 1982. The Indian Navy has platoons of amphibious soldiers, similar to the United States Marine Corps, except that they are incorporated into the navy instead of being a separate armed service. The Indian Navy has an elite special operations unit called "MARCOS" (Marine Commandos). They form a special/covert operations and counter-terrorism unit specialising in sea, air and land warfare. Also, they provide support to Indian Army units in specialised areas, such as preventing infiltration in Jammu and Kashmir's Wular lake. This unit was established in 1986, and is reputed to have a strength of 2000 personnel. The Indian Army maintains the 340 Independent Infantry Brigade (Amphibious) subordinate to 12 Corps (Jodhpur, Rajasthan) of the Southwestern Command. The Indonesian Marine Corps (Indonesian: Korps Marinir) previously known as KKO (Korps Komando Operasi), officially known as KORMAR or simply "Marinir", translated as: Marine Corps, Indonesian Navy is an integral part of the Navy (TNI-AL) and sized at the military corps level unit as the naval infantry and main amphibious warfare force of Indonesia. The Marine Corps is commanded by a two-star marine general. Currently, it has three divisions, which are led by one-star marine general. IRGCN marine forces conducting an amphibious assault exercise during the Great Prophet IX war games. Since the Iranian Revolution in 1979, the number of marines in the Islamic Republic of Iran Navy (IRIN) has expanded to 2,600 personnel, in two marine brigades, each composed of three battalions. Their mission is to provide security throughout the Arabian Sea and free waters, as well as securing routes for Iranian ships in the Gulf of Aden. The Navy of the Iranian Revolutionary Guard Corps (IRGCN) maintains several units which may perform marine-type functions, including at least one 5,000 man brigade of three or four marine battalions. It also has a Takavar naval commando battalion, called Sepah Navy Special Force (SNSF). They are tasked with providing security in the Persian Gulf and Strait of Hormuz, as well as conducting anti-piracy missions to assist Iranian ships. The Iraqi Navy is a small force with 1,500 sailors and 800 marines designed to protect the shoreline and inland waterways from insurgent infiltration. The navy is also responsible for the security of offshore oil platforms. The navy will have coastal patrol squadrons, assault boat squadrons and a marine battalion. The force will consist of 2,000 to 2,500 sailors by 2010. The Givati Brigade functions as the amphibious force and is one of the infantry brigades in the Israel Defense Forces. An Italian marine sets security for his team to safely board a cargo ship to conduct a search of the vessel. The San Marco Marine Brigade is the marine infantry unit of the Italian Navy (Marina Militare). COMSUBIN GOI (Commando Raggruppamento Subacquei ed Incursori Teseo Tesei) is the elite commando frogman force of the Navy and one of the Italian special forces. It is largely drawn from the ranks of the San Marco Marines. The Serenissima Regiment is the amphibious infantry unit of the Italian Army (Esercito Italiano). Its soldiers are called Lagunari and they are the Italian Army Marines. Japanese marines conduct a landing training in 2012. Japan Ground Self-Defense Force Amphibious Rapid Deployment Brigade – Japanese marines tasked with offensive amphibious assault to retake islands. The Republic of Korea Marine Corps is the marine corps of South Korea. Though theoretically it is under the direction of the Chief of Naval Operations, the Marine Corps operates as a distinct arm of the South Korean forces, unlike most other marine branches, which generally operate as part of the country's navy. It was founded as a reconnaissance force just prior to the start of the Korean War. The ROKMC has seen action in several major conflicts. The Korean People's Army's Light Infantry Training Guidance Bureau has two or more amphibious light infantry/sniper brigades. These brigades are believed deployed to Wonsan on the east coast and Namp'o and Tasa-ri on the west coast. In organization and manpower, they are reduced versions of the regular light infantry brigades with a total strength of approximately 5,000 men organized into ten battalions. Each battalion has about 400 men organized into five companies each. Some amphibious brigade personnel are trained as frogmen. Lebanon maintains an elite but very small in number "Navy Commando" regiment. Trained internationally and armed with mostly American and French made equipment and weaponry, the Lebanese Navy Commandos maintain elite but seldom recognized status as some of the most skilled and well-trained special forces (alongside the Lebanese Maghaweer) in the Levant and wider Middle East. Defence Minister Hishammuddin Tun Hussein said in a statement on 10 October 2013, Malaysia is planning on establishing a marines corps for amphibious operations. The Marine Corps will be drawn from all three services, with the majority of personnel coming from one of the three parachute battalions of the 10 Paratrooper Brigade, which will be re-designated as a marine battalion. The 9th Royal Malay Regiment (para) and 8th Royal Ranger Regiment (para) have both conducted amphibious warfare training as a secondary mission and most recently in June 2013 during the CARAT exercise with the US Marine Corps (USMC) and subsequently in an amphibious landing exercise with French troops and the landing platform dock FNS Tonnerre. Malaysian government has yet to decide whether the marines will fall under Malaysian Army or Royal Malaysian Navy. The Maldives National Defence Force maintains a frontline ground combat force known as the MNDF Marine Corps. It is divided into Marine Deployment Units (MDUs) which acts as thr force projection element MNDF. The MNDF Marine Corps, as a naval unit, works closely with the Coast Guard of the country. 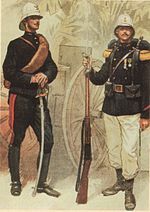 The Mexican Naval Infantry (Spanish: Infantería de Marina) of the Mexican Navy consists of 25,000 marines spread in a brigade of three battalions, plus a battalion attached to the Presidential Guard Corps, three regional battalions with headquarters in Mexico City, Acapulco and Veracruz, and thirty-five independent companies (mainly In Celaya) and detachments distributed among ports, bases and zonal headquarters. The marines are responsible for port security, protection of the ten-kilometer coastal fringe, and patrolling major waterways. The marines have light arms, heavy weapons and armored amphibious vehicles. The Navy ceded most of its riverine responsibilities to the Army, reducing the size of the marine force, and deploying them back aboard ships where they play a vital role in drug interdiction and boarding of suspect vessels in territorial waters. In 2010, the Mexican Marine Corps began undertaking land-based counter-narcotics operations, in large part due to the marines' reputation of being Mexico's most trustworthy and unimpeachable force. The Myanmar Navy raised a naval infantry battalion of 800 men in 1964, followed by a second battalion in 1967. Two more battalions may have also been raised. They were deployed mainly to the Arakan and Tenasserim areas, and to the Irrawaddy delta, to assist in counter-insurgency operations, but also performed other security duties. Namibian Marine Corps are a battalion sized infantry unit of the Namibian Navy under the command of a naval captain. Its officers and men are part of the navy and use naval ranks though insignia is adopted from Brazilian Marine Corps, The Corps is primarily formed up of a Rapid Reaction Unit,Operation Dive team, Operational boat team and a Special Operations Commando Unit. Support Units include a provost company, service support company and a brass band. The Royal Netherlands Navy naval infantry unit is the Netherlands Marine Corps (Korps Mariniers), founded in 1665 as an infantry regiment to the Dutch Navy. They saw their first amphibious action in 1667 raiding the English coast during the Raid on the Medway. Their Latin motto is Qua Patet Orbis ("As Far as the World Extends"). Today, it is a brigade approximately 2300 marines strong, consisting of two marine infantry battalions (plus one infantry company which is stationed in Aruba), one amphibious combat support battalion and one logistical battalion. The Dutch Marine Corps is an elite light infantry unit, operating as a rapid-reaction force, deployable anywhere in the world within 48 hours. Dutch Marines train in all possible geographical and climate conditions for their role. Enlisted marine recruit training lasts 33 weeks, and marine officers train up to 18 months (including naval academy time). It has its own Special Forces branch known as Maritime Special Operations Forces (MARSOF). The Coastal Ranger Command (Kystjegerkommandoen or KJK) of the Norwegian Navy is an amphibious infantry unit trained to operate in littoral combat theatres, as naval infantry and coastal artillery. There is also an SBS type naval commando unit, the Marinejegerkommandoen. US and Pakistani marines come ashore during a training exercise. The Pakistan Marines division of the Pakistan Navy was re-established on April 14, 1990, with about 100,000 men and plans to expand the force significantly by 2015. The marines are based at PNS Qasim naval base. The Paraguayan Marine Corps (Cuerpo de Fusileros Navales) is a battalion-sized organization consisting of four company sized brigades. In limited cadre form the Marine Corps dates from the late 19th century, although it only achieved significant existence when the three-battalion sized Regimiento de Infanteria de Marina Riachuelo was created in the final stages of the Chaco War of 1932–1935. The Peruvian Naval Infantry (Infantería de Marina del Perú) consists of around 3,000 naval infantrymen and includes an amphibious brigade of three battalions and local security units with two transport ships, four tank landing ships, and about forty Chaimite armored personnel carriers. Since 1982, IMAP detachments have been deployed, under army command, in counter-insurgency operations. Philippine marines push forward during an amphibious assault training exercise. The Philippine Marine Corps (PMC) has a strength of about 7,500 men divided into three brigades. The Philippine Marine Corps is considered the shock force of the armed forces and is the first unit to be involved in any amphibious or seaborne clashes. The Polish Navy maintains several naval infantry units responsible for port and coastal security. The Polish Army maintains the 7th Coastal Defense Brigade, which bears traditions of the disbanded 7th Coastal Defence Division (the Blue Berets), therefore it is sometimes referred to as the Marines of Poland. However, as of 2010 there are no plans by the Polish Army to create an active marine unit. Therefore, the 7th Brigade carries out only limited-scale exercises of amphibious assaults. The third oldest marine corps in the world was founded as the Terço of the Navy of the Crown of Portugal in 1618. The Portuguese Navy still maintains this naval infantry corps, which is currently known as the Corpo de Fuzileiros. The Portuguese Marine Corps consists of about 1500 men, including two naval infantry battalions, a naval police unit, a special operations unit and several support units (logistical, fire support, landing craft, etc.). The 307th Marine Battalion (Batalionul 307 Infanterie Marină) is the light infantry/reconnaissance unit of the Romanian Naval Forces. It is located in Babadag, Tulcea County, and was formed in the mid-1970s for the defence of the Danube Delta and Romanian Black Sea shore. A Russian marine on an exercise in 2003. The Russian Naval Infantry (Russian: Морская пехота) are the amphibious forces of the Russian Armed Forces. The naval infantry includes the 65th Naval Infantry Brigade of the Russian Pacific Fleet, the independent brigades of the Northern and Baltic Fleets and of the Caspian Military Flotilla, and the independent regiment of the Black Sea Fleet. The Russian Navy also has the Russian commando frogmen, an elite unit for underwater reconnaissance and special operations. The Royal Saudi Navy maintains two, 1,500-man marine brigades consisting of three battalions each. The brigades are assigned to the Western Fleet headquartered in Jeddah and the Eastern Fleet headquartered in Jubail. The brigades are equipped with 200 Pegaso BMR AFVs and HMMWVs. South Africa has not had a dedicated marine branch of its military since the apartheid era. However, the South African Navy's Maritime Reaction Squadron is a marine-type unit, which currently consists of four companies. It is planned that this squadron will eventually become a battalion sized unit. Members are marines and use naval ranks. They are trained in infantry combat up to company sized operations. They are also used for crowd control and conduct peacekeeping operations. During peacekeeping operations they are meant to augment an army infantry battalion. Their role is very similar to the now disbanded South Africa Marine Corps from the apartheid era. The 4 Special Forces Regiment of the South African Special Forces provides South Africa its seaward Special Forces capability. The 9 South African Infantry Battalion of the South African Army is a seaborne infantry that carries out amphibious warfare operations. Spanish Navy marines deploying from an AAV-7 amphibious armored personnel carrier. The Spanish Navy Marines (Infantería de Marina) are the oldest existing marine force in the world, as they were established on February 27, 1537, by Charles I when he permanently assigned the Compañías Viejas del Mar de Nápoles (Naples Sea Old Companies) to the Escuadras de Galeras del Mediterráneo (Mediterranean Galley Squadrons). Their red trouser stripes mark the Infanteria de Marina as part of the Royal Household Corps, an honor only shared with the Royal Guard, and were given by Charles III to the marines in reward for their fierce defence of the Castillo del Morro of Havana, Cuba against a British expedition in 1762. The Sri Lanka Navy established its first Marine Battalion in November 2016 and the first group of members were assisted in training by the 11th Marine Expeditionary Unit of the United States Marine Corps. The unit became functional after the first group of members consisting of 6 officers and 158 sailors graduated from training on the 27th of February, 2017. This Battalion specializes in Amphibious Warfare. The Swedish Amphibious Corps (Svenska amfibiekåren) is an arm of the Swedish Navy. The Corps consists of one battalion, tasked with reconnaissance, amphibious assaults and combat on, over and under the surface of the sea. The Fouj Al-Mughawayr Al-Bahir (Arabic: فوج المغاوير البحر‎, meaning "Marines Regiment") is a unit based in Latakia Governorate. It has participated in operations in the Syrian Civil War. The Republic of China Marine Corps (traditional Chinese：中華民國海軍陸戰隊) is responsible for amphibious combat, counter-landing and reinforcement of the main island of Taiwan, remote islands, defense of ROCN facilities, and also functions as a rapid reaction force and a strategic reserve. Royal Thai Marine Corps (RTMC) is the naval infantry sub-branch of the Royal Thai Navy. Over the span of 60 years, thr RTMC grew from the size of a regiment, to a 20,000 strong service branch. The Royal Tongan Marines is a sub-unit of the Tongan Maritime Force, which itself is a branch of the Tonga Defence Services. It is a single battalion sizeed group composed of a Headquarters Company, which is supported by 3 Light Infantry Companies. The Amphibious Marine Infantry Brigade Command is the marine force of the Turkish Naval Forces and consists of 4,500 men based in Foça near İzmir: in three amphibious battalions, an MBT battalion, an artillery battalion, a support battalion and other, company-sized units. The Ukrainian Marines was founded in 1993 from a unit of the former Soviet Naval Infantry. It serves as a coastal defense force of the Ukrainian Navy. Also known by its official name, the Ukrainian Naval Infantry, the division sized sub-branch of the Navy is based in Mykolaiv. The UAE Marines is a battalion-sized unit; it is equipped with BTR-3s. British Royal Marines disembark from their Rigid Raider assault craft onto a beach during an exercise. The Royal Marines (RM) were formed in 1664 and are part of HM Naval Service. Apart from musicians, they have the longest basic infantry training in the world which stands at 32 weeks for an enlisted recruit and 64 weeks for a young officer. They include an amphibious and expeditionary brigade (3 Commando Brigade RM, which includes commando-trained units and individual personnel from the British Army, Royal Navy and Royal Air Force), a naval security unit responsible for guarding the UK's naval nuclear weapons and other security duties (43 Commando Fleet Protection Group Royal Marines), a landing craft and boat-training group which is also a parent unit for three landing craft units deployed on amphibious warfare ships; and a naval musical branch (the Royal Marines Band Service). The RM has close international ties with allied marine forces, particularly the United States Marine Corps and the Netherlands Marine Corps/Korps Mariniers. "Marine" is also used as a rank in the Royal Marines, being equivalent to an army private. Their motto is "Per Mare, Per Terram", which is "By Sea, By Land" in Latin. The Royal Marines Reserve (RMR) is the volunteer reserve force used to augment the regular Royal Marines in times of war or national crisis. Marine officer from the US scaling the seawall at Inchon, 15 September 1950, during the Korean War. Marines from the US conducting a live fire training exercise aboard an amphibious assault ship in 2004. The United States Marine Corps (USMC) is currently the largest and only marine combined-arms force in the world. Created in 1775, it was originally intended only to guard naval vessels during the American Revolutionary War. While the USMC is a component part of the US Department of the Navy in the military command structure, it is a separate military branch from the United States Navy, with its own representative on the Joint Chiefs of Staff. The Corps’ major functions include: seizure or defense of advanced naval bases and ... land operations ... essential to ... a naval campaign, ... provid[ing] detachments and organizations for service on armed vessels of the Navy ... [and] security detachments for the protection of naval property at naval stations and bases ... and such other duties as the President may direct ... [and] develop[ing] ... those phases of amphibious operations that pertain to the tactics, technique, and equipment used by landing forces. It also conducts maritime boarding operations and operates its own aviation units mainly to provide air support to the rest of its forces. It also has other missions. These include, among others, providing personnel as security guards at US diplomatic missions throughout the world, and providing helicopter transportation for the President of the United States aboard Marine One. Its motto is Semper Fidelis, which means "always faithful" in Latin. The United States Marine Corps Reserve (USMCR) is the reserve force of the United States Marine Corps. Military and naval doctrine in the United States is that "Naval Infantry" is the use of: "... sailors performing as infantry, and sometimes providing land based artillery support ..."
The Uruguayan Marine Corps (Cuerpo de Fusileros Navales or FUSNA) is a battalion-sized organization consisting of four company sized brigades. The Venezuelan Marine Corps (Infantería de Marina) is a sub-division of the Venezuelan Navy. Headquartered in Meseta de Mamo, Vargas, the estimated numerical strength of this unit is approximately 8,000 men and women. Its mission is to "enlist and direct its units in order to form the disembarking force and/or support of amphibious or special operations; executing naval safeguarding and environmental policing, as well as actively participating in the national development". The Vietnam People's Navy maintains a naval infantry force. It once stood at eleven brigades each of several battalions. The first naval infantry unit was established in 1975 and was known as the 126th Brigade. Currently the Vietnam People's Navy maintains two naval infantry brigades which are the 101st Brigade and 147th Brigade. The ancient Greek states did not possess specialized marine infantry, instead they used hoplites and archers as an onboard contingent (epibatai). The Roman Navy used regular infantry as marines. Naval personnel were trained for raiding and also provided the troops for at least two legions (I Adiutrix and II Adiutrix) for service on land. The various provincial fleets were usually provided with marines from the adjacent legions. Several of the Colonial navies of Australia raised volunteer naval infantry and naval militia brigades in the second half of the 19th century. The Victorian Naval Brigade was formed in 1859, the Sydney Naval Brigade in 1864 (later supplemented by the Naval Artillery Volunteers in 1897) and the Queensland Naval Brigade in 1873. Following the Federation of Australia they were combined into the Commonwealth Naval Militia. With the formation of the Royal Australian Navy in 1911 they were renamed the Royal Australian Naval Brigade. At its peak in 1915 it numbered 2,817 officers and men. The Naval Brigade was disbanded in 1920 and volunteers were absorbed into the Royal Australian Naval Reserve. For several centuries, the Byzantine navy used the descendants of the Mardaites, who were settled in southern Anatolia and Greece, as marines and rowers for its ships. Emperor Basil I also established a separate marine regiment, 4,000 strong, for the central Imperial Fleet based at Constantinople. These were professional troops, and were counted among the elite tagmata. In the 1260s, when emperor Michael VIII Palaiologos rebuilt the navy, he recruited the Tzakones (settlers from Laconia) and the Gasmouloi (men of mixed Greek-Latin descent) as special marine troops. Despite the progressive decline and virtual disappearance of the navy, they remained active until the late Palaiologan period. The Confederate marines was a branch of the Confederate States Navy and was established by the Confederate Congress on 16 March 1861; they were mainly (80%) defectors from the US Marines. Marineregimentet (The Marine Regiment) was the naval infantry of the Royal Dano-Norwegian Navy. The Meredessantpataljon, was a short lived infantry battalion of the Estonian Navy. The battalion was created in 1919 from the crews of the Estonian surface warships and was based in Tallinn. The unit was mainly used on the Southern Front during the Estonian War of Independence. The unit was operational from March to June in 1919. The Troupes de marine were founded in 1622 (as compagnies ordinaires de la mer) as land forces under the control of the Secretary of State of the Navy, notably for operations in French Canada. The Compagnies de la Mer were transformed in line infantry regiments by Napoleon, but became once more marine forces in 1822 (for the artillery) and 1831 (for the infantry). These Troupes de marines were in the 19th century the main overseas and colonial forces of the French military. In 1900 they were put under the orders of the War Ministry and took the name of Troupes Coloniales (Colonial Forces). In 1958 the designation of Troupes Coloniales was changed to Troupes d'Outre-Mer (Overseas Forces) but in 1961 it reverted to the original Troupes de marine. Throughout these changes in title these troops continued to be part of the French Army. The Confederation of Gran Colombia Marines were formed in 1822 and were disbanded in 1829, Personnel were mostly from Venezuela. German Empire: During the German Imperial era, three ‘sea battalions’ or Seebataillone based at Kiel, Wilhelmshaven and Tsingtao were maintained. These units served intermittently as colonial intervention forces. The III Seebataillon at the imperial navy's east Asian station at Tsingtao was the only all-German unit with permanent status in a protectorate/colony. The battalion fought at the Siege of Tsingtao. East Germany: The East German army's Nr29. Regiment ("Ernst Moritz Arndt") was a Motorized Rifle Regiment intended for amphibious operations in the Baltic Sea; while the Volksmarine Kampfschwimmer: Combat swimmer units were intended for support of amphibious operations and for raiding. At the time of the Iranian Revolution in 1979, the Imperial Iranian Navy had three battalions of marines. The old Ba'athist-era Iraqi Navy maintained several marine companies. The Iraqi Republican Guard maintained a Marine Brigade as part of its 8th As Saiqa Special Forces Division. The brigade was equipped with Brazilian made Engesa EE-11 Urutu wheeled armored personnel carriers. The Blackshirt militia maintained an independent Marine Group with four MVSN battalions (24th, 25th, 50th and 60th). During the feudal period the Japanese used Ashigaru soldiers or regular Yumi archers as soldiers to protect ships from pirates. In 1873 a short-lived marine corps was added to the newly created Imperial Japanese Navy, using Britain's Royal Marines as a model. Considered unsuitable in its original form this force was disbanded in 1878. Both the Imperial Japanese Navy and Imperial Japanese Army subsequently established marine-type units. Both were dissolved at the end of World War II and Japan does not currently have marines as such. Special Naval Landing Forces were the Empire of Japan's Marine Corps. The IJN also maintained the Guard Forces (keibitai) and Defense Units (bobitai), both of whom also received amphibious assault and beach defence training. However, their performance was poor or average when they were used as assault troops. The Imperial Japanese Army's 3,500 man Sea-Landing Brigades (1st to 4th) were used to conduct amphibious assaults on an island, but afterwards they stayed to garrison that island. The Corps was founded on 10 December 1665 during the Second Anglo-Dutch War by the unofficial leader of the republic Johan de Witt and Admiral Michiel de Ruyter as the Regiment de Marine. Its leader was Willem Joseph Baron van Ghent. The Dutch had successfully used ordinary soldiers in ships at sea in the First Anglo-Dutch War. It was the fifth European marine unit formed, being preceded by the Spanish Marines (1537), the Portuguese Marines (1610), the French Marines (1622) and the English Royal Marines (1664). Like Britain, the Netherlands has had several periods when its Marines were disbanded. The Netherlands itself was under French occupation or control from 1810 until 1813. A new marine unit was raised on 20 March 1801 during the time of the Batavian Republic and on 14 August 1806 the Korps Koninklijke Grenadiers van de Marine was raised under King Louis Bonaparte. The modern Korps Mariniers dates from 1814, receiving its current name in 1817. The battle honors on the Korps Mariniers' colors are: Raid on the Medway (1667), Kijkduin (1673), Sennefe (1674), Spain, Dogger Bank (1781), West Indies, Algiers (1816), Atjeh, Bali, Rotterdam (1940), Java Sea (1942), Java and Madoera (1947–1948), New Guinea (1962) and Cambodia (1992-1993). The role of Ottoman naval infantry originated in Orhan's conquest of the Karasi Beylik and the capture of its fleet. From then on Janissaries and Azaps were sometimes deployed as marines during the 14th Century. The Deniz azaps were used during the 16th Century; while troops called Levend (Bahriyeli) were raised on and off over the centuries - over 50,000 of them by the late 18th century. The last raised units were the Ta'ifat al Ru'sa (corsair captains militia) recruited from among the North African Arabs and indigenous Berbers. Ottoman marines were part of the Ottoman navy. Portugal raised numerous companies of Special Marines (Fuzileiros Especiais) and African Special Marines (Fuzileiros Especiais Africanos), both at home and in the African colonies of Portuguese Guinea, Portuguese Angola and Portuguese Mozambique, for service in Africa during the Portuguese Colonial Wars. The African Special Marines were all-black units. The Imperial Russian Navy used several regiments of marine equipage troops that fought as much on land as they served in ship detachments. One battalion was formed within the Guard, and served on the Imperial family's ships. The Soviet Navy had a number of small battalion-sized naval infantry and coastal defence units that mostly served in the ports and bases before the Second World War. During the war, and building on the visuals of the mutinied sailors of Petrograd in 1917, the Stavka ordered formation of naval infantry brigades from surplus ship crew or shore duty sailors, and forty brigades served in mostly ground troops roles until 1944 when they were used for amphibious operations in Norway and along the Black Sea coast. The South Africa Marine Corps was set up as a sub-branch of the South African Navy in 1979, with the primary purpose of protecting harbours. The Marines were disbanded in 1989, following a major restructuring of the Navy at the end of the South African Border War. The Royal Marines date from the establishment of a Maritime Regiment of Foot in 1664. Six Marine Regiments for Sea were formed in 1702 but by 1713 they had been disbanded or taken into the army as regiments of foot. In 1755, a permanent Corps of fifty companies of marines was established for direct service under the Admiralty and this force has an unbroken descent to the Royal Marines of today. See History of the Royal Marines. The Royal Navy has since its beginning formed naval landing parties of seamen for action ashore, this being later formalised into the Naval Brigades. These brigades would often dismount guns from their parent vessels for use ashore, these guns often being the only artillery available. The most famous example of this form of land service was provided by the guns accompanying the forces relieving Ladysmith. The Corps of Colonial Marines were raised from former American slaves as auxiliary units of the Royal Marines for service in the Americas: Two of these units were raised and subsequently disbanded. The first was a small unit which existed from 1808 to 12 October 1810, the second was more substantial and existed from May 1814 to 20 August 1816. The Royal Naval Division was part of the Royal Navy in the First World War. In 1914, the shortage of ground forces for the Western Front led to the creation of the Division, composed of two brigades of sailors and a brigade formed by the Royal Marines. The Division was part of the Royal Navy but for command purposes was integrated into the army's command structure. The sailors were initially disappointing as infantry, but eventually developed into one of the better divisions. The Division participated in the defence of the Belgian city of Antwerp in late 1914, and then served with heavy casualties at the Battle of Gallipoli. At different times the Division included various army units. The division ceased to exist after the end of the First World War. Gooch's Marines, the 61st Foot, raised in the American colonies for the War of Jenkins' Ear in 1739. This was a 3,000 man American regiment of the British Army that served alongside British Marines. Among its officers was Lawrence Washington, half-brother of George Washington. It was disbanded as a regiment in 1742 and the remaining independent companies were merged with another regiment in 1746. American Colonial Marines were State Marines raised for the various state navies that came into existence shortly before the Revolutionary War. The Continental Marines were the marine force of the American Colonies during American Revolutionary War. The Corps was formed by the Continental Congress on November 10, 1775, and was disbanded in 1783. The Continental Marines' first and only Commandant was Captain Samuel Nicholas. Hillet Marine River Regiment of the Union Army during the American Civil War, this regiment consisted of 10 rifle companies, a Cavalry Battalion of 5 companies, and an artillery battalion of three batteries, all of whom operated from Mississippi River gunboats as part of the Mississippi River Squadron. The Republic of Texas Marine Corps – Although a marine corps was suggested in the "Act and Decree Establishing a Navy," passed on November 25, 1835, it was not until acting governor James W. Robinson strongly urged the swift formation of such an organization in his message to the General Council on January 14, 1836, that steps were actually taken to commission officers of marines and recruit enlisted personnel. Before the end of the Republic of Texas and annexation to the United States, more than 350 men served with the Texas Marine Corps, and at least eighteen officers were commissioned to command them. The Texas Marine Corps served under the direction of the Navy Department of the Republic, and the duties of the corps were specifically ordained in fifteen articles passed by the Texas Congress on December 13, 1836. The corps was modeled upon the United States Marine Corps, but no post of commandant was ever established. Marines served under their own officers aboard ship and ashore but were subject to the orders of the senior naval officer present. Pay and allowances were based upon those of the United States Marine Corps, and the uniform of the Texas Marine came from discontinued USMC stocks, changing only the buttons and cap devices to those of Texas configuration. Vietnamese dynasties had a long tradition of utilizing marines. This tradition went back no later than the Annam Protectorate of Tang dynasty when the governors built boats and trained marines to fight off pirates and invaders. The successive Vietnamese dynasties made full use of their marines' superiority at river and sea to launch successful campaigns against their northward and southward neighbours alike. The forerunner of the Republic of Vietnam Marine Corps (VNMC) was established by Ngo Dinh Diem, then prime minister of what was then the State of Vietnam on October 13, 1954. The Republic of Vietnam was established in October 1955 after Diem used a fraudulent referendum to topple Bao Dai. The VNMC became defunct on 1 May 1975 after the fall of Saigon. The 12th Naval Infantry Brigade (12. brigada mornaričko desantne pešadije) of the Yugoslavian Navy consisted of 900 to 2,000 men in three battalions. A multi-ethnic unit, the brigade was broken up during the dissolution of the Yugoslav federation and saw little action. ^ Casson, Lionel (1991). The Ancient Mariners (2nd ed.). Princeton University Press. ISBN 0-691-01477-9. ^ Lendering, Jona. "Legio I Adiutrix". Livius.org. Retrieved 7 February 2010. ^ Lendering, Jona. "Legio II Adiutrix". Livius.org. Retrieved 7 February 2010. ^ Carro, Domenico (2015). "Vox Navalis". Roma Aeterna. p. 107. ^ Estes, Kenneth W.; Heinl, Robert Debs (1995). Handbook for Marine NCOs. Naval Institute Press. ISBN 1-55750-238-2. ^ "Historia de La Infanteria de Marina" (in Spanish). Spanish Navy Marines. Retrieved 7 February 2010. ^ English, Adrian J. C. Armed Forces of Latin America. pp. 36–44. ISBN 0-7106-0321-5. ^ "Specialist force trained for East Timor-style operations". Herald Sun. 12 December 2012. ^ "Commando Training - RBDF". rbdf.gov.bs. ^ English, Adrian J. C. Armed Forces of Latin America. pp. 177–178. ISBN 0-7106-0321-5. ^ "TDM : Spécialité AMPHIBIE". ^ The IISS estimates the IRGC Naval Forces are 20,000 strong including 5,000 marines (one brigade). ^ "We're sorry, that page can't be found" (PDF). Archived from the original (PDF) on 2017-02-10. ^ "Malaysia to establish marine corps, naval base close to James Shoal". IHS Jane's 360. Retrieved 18 October 2013. ^ Miroff, Nick; Booth, William (4 December 2010). "Mexico's marines team with U.S. DEA" – via washingtonpost.com. ^ English, Adrian J. C. Armed Forces of Latin America. pp. 355 & 356. ISBN 0-7106-0321-5. ^ "The official website of Sri Lanka Navy". news.navy.lk. Retrieved 2017-06-15. ^ "Royal Marines Recruit Training". Secretary of State for Defence. Archived from the original on 3 February 2009. Retrieved 14 November 2008. ^ "Royal Marines Officer Training". Secretary of State for Defence. Archived from the original on 7 October 2008. Retrieved 14 November 2008. ^ United States Department of the Navy. "Expeditionary Operations" (PDF). United States Government. p. 35. Archived from the original (PDF) on 13 November 2008. Retrieved 14 November 2008. ^ Composition; functions. United States Marine Corps. 10 U.S. Code § 5063 (a) & (b). Retrieved 6 December 2016. ^ "Summary". Sailors as Infantry in the US Navy. Naval History and Heritage Command. Retrieved 6 December 2016. ^ Felten, Markus. "Geschichte der Marine-Infanterie (1675-1919)". ^ Nakanishi, Ritta. Japanese Military Uniforms 1841-1929. p. 79. ISBN 4-499-22737-2. ^ "Birth of Marines". Recruit Knowledge. MCRD Museum Historical Society. Archived from the original on 2006-05-23. Retrieved 2006-02-03. ^ M., SULLIVAN, DAVID (15 June 2010). "REPUBLIC OF TEXAS MARINE CORPS". This page was last edited on 21 April 2019, at 11:50 (UTC).